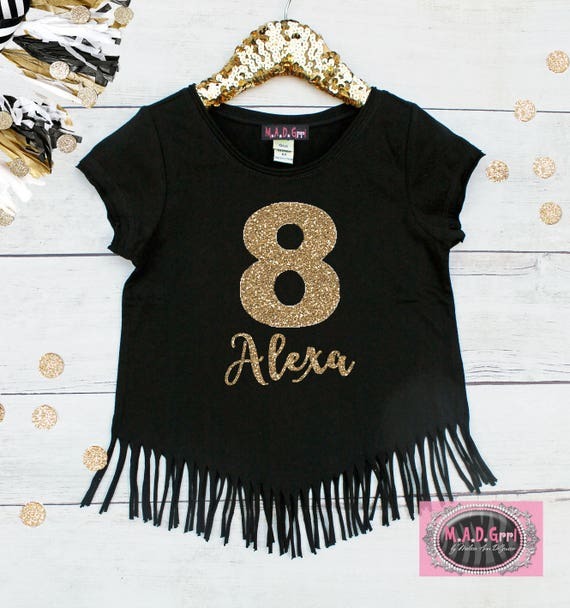 This trendy, fringe bottom tee is a perfect choice to celebrate your special girl's 8th birthday. The personalized gold glitter design does not shed, and is professionally applied to your garment with loving care. Please wash inside out on gentle cycle in cold water and lay flat to dry. Free name personalization. Please indicate name in message to seller section at checkout. THIS SHIRT STYLE RUNS SMALL. PLEASE ORDER ONE SIZE UP. ALL ITEMS SHIP IN 7-10 BUSINESS DAYS, NOT INCLUDING WEEKENDS, HOLIDAYS AND SHIPPING TIME. Please see the estimated shipping times below. Message us if you need a RUSH order and indicate the date needed in the message to seller section at checkout. We answer customer messages within 24 hours on business days.